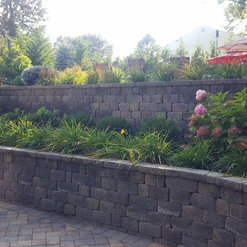 I had a retaining wall and patio installed by Roy Targia. From the estimate to completion of the job it couldn’t have gone any smoother. Roy and the crew showed up on time. Their work is amazing and the crew is very professional. It was a pleasure to work with Roy and his crew. I’m very satisfied with the work that was done. And plan on using Roy for all my future projects and would highly recommended to my family and friends. Just had our family room fireplace completely redesigned with stone. We are so happy with the results. The craftsmanship is outstanding. Special thanks to Roy, Joe and the entire team! We were in the market to replace our pavers driveway with new pavers and heated. Roy was referred to us. He went above and beyond to find the right company to install the heat that weren’t going to rip us off. Everything turned out amazing and we no longer have to worry about shoveling again! All the work went according to the schedule. Very responsive and professional staff. I would hire them again. They did work with my chimney and it looks great. Roy and his crew were a pleasure to work with. He helped us with the design and material choices for a new front porch and walkway. The crew was professional and friendly, even working in some challenging (cold) conditions. We hope to have them back next year to do more work in our back yard! Roy and his team were fast and efficient and did a beautiful job on our patio. They really knew what they were doing. We are very happy with the results. 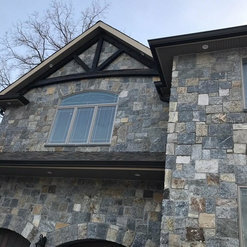 ROY TARGIA MASONRY is EXCEPTIONAL! 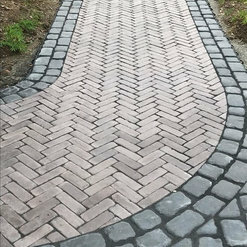 If you are looking for a true "mason" who has vision, creativity and is authentic in his craft, then you want Roy & his team to do your outdoor project! 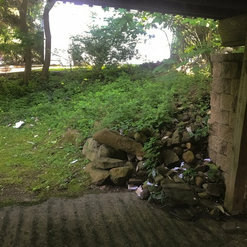 I received no less than 5 estimates for an outdoor project of a small space that would involve a seamless tie in of an original lower tier patio of lilac bluestone, new stairs installed (old demolished) leading from our French doors; a retaining wall along our fence line and the addition of an outdoor kitchen that is approximately 14 foot long AND jacking out old mortar and "re-gritting" to look like new! 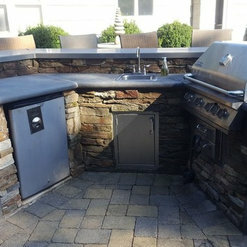 I was insistent on using natural stones - lilac bluestone- irregular stones + Pennsylvania field stone with bluestone toppers... Roy was the only mason that actually wanted to WORK with the materials that I wanted to use; but better than that, added incredible suggestions that captured what I was trying to accomplish in the limited space. He understood how impactful a small space could be! Other estimates from Stone masons included the run of the mil - "slap down" of pavers where the company wanted to "get in and get out". Roy came the same day that I called for an estimate. We discussed at length the project inclusive of the details, timing and challenges as well as my budget. He met me at the stone yard to review products & ensure that each detail was covered. His price was at the top of my budget; but I KNEW based on the interaction with him on the project that I would get EXACTLY what I wanted and not be disappointed! In hindsight now, his price was very fair and there was not 1 additional "over run". The contract was clear, concise & on point. 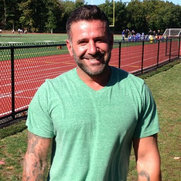 His team was nothing short of EXCEPTIONAL (and I have worked on many projects over the years, with many ranges of contractors). Roy's team were ARTISIANS in every sense of the word. Roy was on sight every morning to review the day with myself, his team and his foreman. Joe (his foreman) was outstanding in every way! He kept me in the loop at all times, and ensured that even when we were met with a challenge (which all projects do) - we could devise our next steps and we both were on the same page. At his impeccable direction daily with the team members on site, they were able to complete my project EARLY!!! (A renovators dream)!!! The team arrived early each day & left late each day. They cleaned their work areas each evening, and did the best they could to ensure that there was no damage to my existing structure or outdoor flower beds throughout the 12 day project - working in VERY tight spaces. When a flower bed stone wall was slightly damaged by the big equipment, I didn't even have to ASK to have it repaired back to its original state. It was automatically done. This also included the sidewalk slate that incurred damage. Repaired without any discussion... You will NOT regret calling Roy Targia to have your project done! I will recommend him exclusively for any work such as this! He is exceptional, and it doesn't hurt that he is authentic in every way. The real deal. I hired Roy to build a boulder retaining wall to line the front of my property. He suggested a beautiful rock/stone for the property which turned out amazing. It tied the entire project together. I liked how Roy met with me a few times before the project had begun. He discussed the budget and timeline and stuck to it. I really appreciated the communication between Roy, because I’m usualky unavailable to pick up a phone so I liked the fact that my responses were answered in text, when possible. I recommend him highly, the work quality is impeccable. Thank you Roy and his team. The price was fair and the work done was great quality. We requested pavers with a border and a reinforced area for a hot tub. The job was completed just as we asked and in the time promised. The patio turned out beautiful we were very pleased with the job. Clean-up and all the finishing touches added to our satisfaction. The workers were friendly and professional. We would definitely hire Roy Targia to do masonry work in the future. We hired Roy to do our backyard pavers around the pool and he did an amazing job. From the moment he came by for the estimate, he was very professional and gave a very fair price. The work was done timely and we could not be happier with the results. Roy is the best at what he does and we will be hiring him for any future projects we have! Roy and his team do amazing work and are extremely efficient. 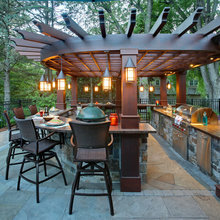 Roy has a creative mind when it comes to designing hardscapes like no other mason out there. My wife and I couldn’t be happier with their work. We will definitely be using them again for other projects in our backyard. 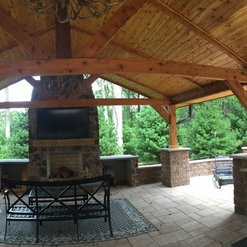 Thank you for posting photos of our work and great review. We strive for the best. we look forward to working with you in the future. I’ve known Roy for many years and familiar with Roy and his team’s meticulous work, so I did not hesitate to contact him and trust them with my project. Roy came the same day to give me an estimate. Within a few days, Roy and his team came and got the job done. They work tirelessly to provide top notch work with quality products. They completed stone/tile work around my concrete porch foundation and garage. They also renovated my front yard putting in retaining block walls/planters. The work has transformed my home! 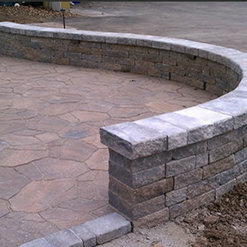 I would highly recommend Roy Targia Masonry and his team of hard workers! Thank you very much, your project came out beautiful, It was tedious but worth it at the end.